Postcard US-2738798 to the Netherlands shows a map of Route 66 from Los Angeles to Chicago. Also known as the Will Rogers Highway or the Main Street of America, U.S. Route 66 was one of the original highways within the U.S. Highway System. It was established on November 11, 1926 with road signs up the following year, originally ran from Santa Monica, California, through Arizona, New Mexico, Texas, Oklahoma, Kansas, Missouri, to Chicago in a distance of 2,448 miles or 3,940 kilometers. According to Wikipedia, Route 66 served as a major path for those who migrated west, especially during the Dust Bowl of the 1930s. It was officially removed from the United States Highway System on June 27, 1985 after it had been entirely replaced by the Interstate Highway System. Portions of the road that passed through Illinois, Missouri, New Mexico, and Arizona have been designated a National Scenic Byway of the name "Historic Route 66". Several states have adopted significant bypassed sections of the former US 66 into the state road network as State Route 66. 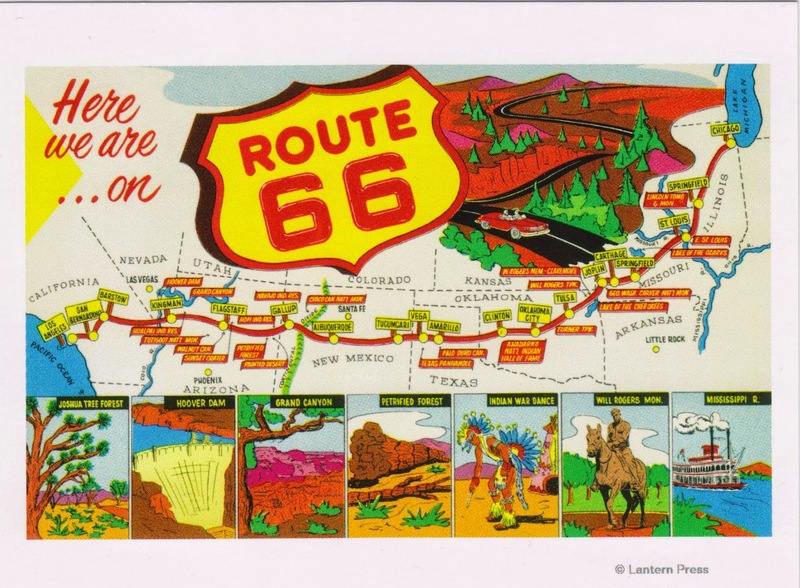 The map was originally created in 1956 with inserts showing such famous scenes along the route as Joshua Tree Forest, Hoover Dam, the Grand Canyon, the Petrified Forest, Indian War Dance, Will Rogers Monument and the Mississippi River. The postcard is available for purchase at Zazzle.